Ministry of Propaganda - 22/Dec/2005: "Merry Christmas, Mr Hales!" You write We are posting this Summary to you via Recorded Delivery so that we have signed proof that it has been received. Ahem, I think you're out of luck here. Either Royal Mail couldn't be bothered or your 'sending nasty letters' department is incompetent, the letter was delivered as a normal letter. I didn't sign a thing. Logic dictates that you therefore have no proof whatsoever that I've received this letter. Well, apart from this blog entry, but then I assume that wasn't what you had in mind. You then continue, The enclosed Summary shows that we have previously explained to you in detail how to get a licence and the consequences or remaining unlicensed. We may inform the court of the protracted length of time you have been unlicensed, and also of the number of times you have failed to respond to our efforts to contact you. Hm, since I don't need a licence (as you admit), I assume there aren't any consequences of remaining unlicensed? After all I can't obtain a licence for something I don't have. But you're right, the court might be interested in the number of times you have harassed and bullied me for something I clearly don't need. 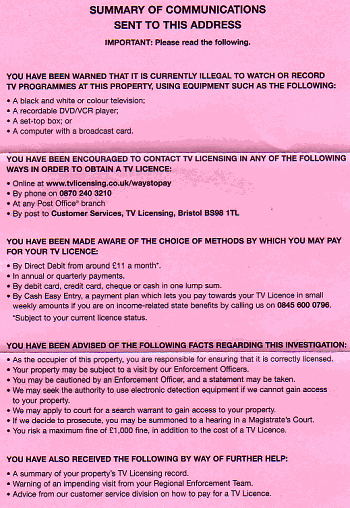 Oh, but then you finally seem to get a clue: If you do not use TV receiving equipment at this property, please do not ignore this letter. Please call 0870 240 3210 so we can remove your address from this investigation. On second thoughts, no, you still don't get it. You want me to call an 0870 number? No, not going to happen. I say no to 0870 (but can't be bothered to search for your number). I'm not going to pay to call you. Give me a freephone number and I might consider calling you. Especially because you finally enclosed a reply envelope, only for me to discover that it has written YOU NEED TO USE A STAMP in big capital letters on it. Let's be clear here: You want something from me. I am your 'customer'. The customer is always right. So be nice to me. With that I think I will close. Have a merry Christmas and a Happy New Year, Mr John Hales! 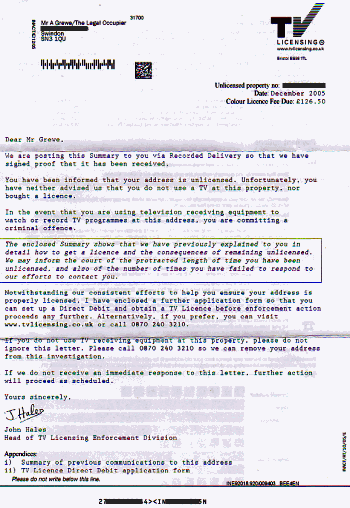 PS: If this is the first entry about TV Licensing you read on this blog you might want to also read the rest of the TV Licensing Saga.